After years of dragging its feet, Apple is finally ready to enter the world of NFC mobile payments. Today, at its iPhone 6 launch event in Cupertino, California, Apple unveiled details on Apple Pay, the new mobile payments platform being built in to the company’s newest devices. To use Apple Pay, you simply need to touch your phone to the NFC receiver located at many major stores’ payment terminals. Apple Pay is designed to use Touch ID for security: Your phone knows it’s you making the payment, because it can match up your fingerprint. No PINs are ever required. You can link the card you have on file with iTunes to the service or add cards using your phone’s camera (likely requiring a verification step). Cards added to Apple Pay are never uploaded to the company’s servers, reducing your payment data’s exposure to hackers. Stores don't see your data, either. That’s a really nice feature, given how terrible stores like Target and Home Depot have been protecting customer data. Because Apple Pay builds on the already in-use NFC payment equipment in stores, plenty of major retailers are already on board. Starbucks, Staples, Panera, Target, Macy's, Bloomingdales, Walgreens, Subway, Staples, McDonald's and Whole Foods will all offer tap-to-pay at launch. Others like Disneyland/Disney World, Sephora, Nordstrom and Chipotle will join by the end of the year. A large majority of banks are also on board with the service. 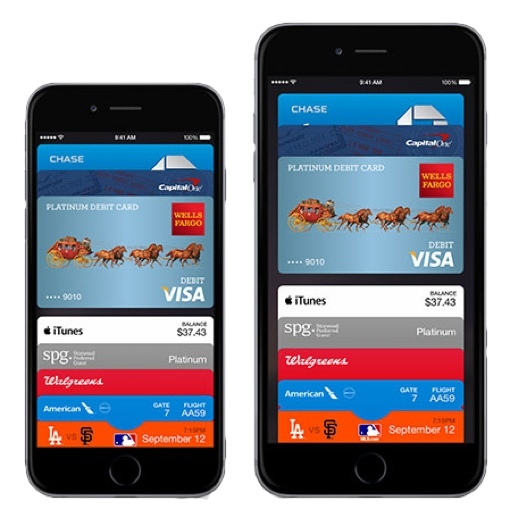 You will also see Apple Pay built into apps for buying goods online too. Groupon, Target, Uber and OpenTable have been announced, but many more will likely jump on board since Apple has opened up the Apple Pay API to developers. Apple Pay will be available in the U.S. starting in October 2014. Plans to expand the service worldwide are already in the works.